Intentional Conscious Parenting: Carol and Stacy Interview Howard Binkow: Author of the Howard B. Wigglebottom children's books. Carol and Stacy Interview Howard Binkow: Author of the Howard B. Wigglebottom children's books. 1. Did you always know you wanted to be a children's writer, or did it come to you later on in life? It came to me later on in life. I first realized the importance of being a good listener when I was sixty years old. Practicing what I learned dramatically improved the quality of my life and finances. 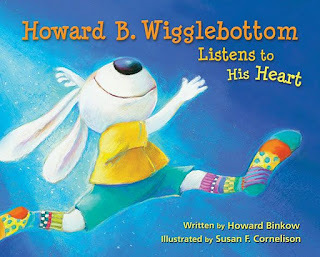 I decided to write Howard B. Wigglebottom Learns to Listen, a picture book to help introduce the subject of listening in our public schools. 2. How many children's books have you written? So far there are eleven books in the Howard B. Wigglebottom series. 3. How did you come up with Howard B Wigglebottom the character? One of our illustrators came up with a bunny character named Harold B. Wigglebottom. My family insisted the first name be Howard. 4. How long does it take you to write a book? Our team created as many as three books in a year. 5. How did you find your illustrator? We work with a team of illustrators that we find by word-of-mouth. 6. Do you have a literary agent? Did you use traditional publishing or self-publishing? We are self-published. The only literary agent we have is for foreign rights. 7. Any suggestions for new picture book authors trying to get their books notices? Create books that are unique, then be patient and persistent. 8. Have you incorporated social media into your book campaigns? Have you heard of virtual book tours? I have but we are not currently doing any. 9. Do you have any children of your own, if so how have they responded to your children's books? I have four beautiful children and in laws and ten grandchildren. From time to time, one of my children will remind me to re-read Howard B. Wigglebottom Learns to Listen. 10. What is the collective message of all your books? What would you like children to gain from reading your books? The intention of our Howard B. Wigglebottom books is to enable young children to be better listeners, learn important life lessons and feel good about themselves. 11. What would you like our audience to know about you that they don't already know? Our books are a team effort. I am only one of the writers. 12. Are your books available on Kindle and Ereaders? There are four Howard B. Wigglebottom as Iphone Ipad apps. We plan on being on Ereaders in 2012. 13. Share with our audience what they will find on your website. A page where children can write and color their own books. For those who prefer hard cover books, we offer them at a 50-60% discount. 14. Did you write all the songs yourself? The songs were written by Reverend Ana Rowe and several very talented musicians. Join us for a live author interactive typed chat with Howard Binkow in our BlogFrog parenting Community Tuesday November 15th, 9 PM Eastern, 8 Central, 7 Mountain, 6 Pacific.